The severity of weakness and hypotonia seen in SMA also varies according to the type of SMA a patient has. SMA type 0 patients have profound hypotonia that includes fewer fetal movements in utero.4 Similarly, X-linked infantile SMA (XL-SMA) involves severe congenital hypotonia.5 XL-SMA patients have areflexia and often suffer congenital contractures that result from prenatal weakness and associated lack of movement. The weakness seen in these patients in progressive. In SMA type 1, hypotonia tends to present in early childhood.6 Like those with SMA type 0 and XL-SMA, the hypotonia in SMA type 1 patients is also profound.7 It presents with symmetrical flaccid paralysis and is often associated with zero ability to move the head. 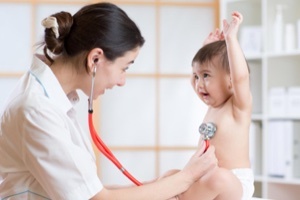 In addition to physical examination and molecular diagnosis, electrodiagnostic studies can also help to identify SMA in those with infantile hypotonia.2 For instance, when needle eletromyography shows signs of denervation, infantile SMA is likely. Given the medical tools available, it should now be possible to identify SMA through a variety of means, but weakness and hypotonia are potentially the initial indications that one should consider an SMA diagnosis. 2. Renault F. [The role of electrodiagnostic studies in the diagnosis of hypotonia in infancy]. Rev Med Liege. 2004;59 Suppl 1:190-197. 5. Baumbach-Reardon L, Sacharow SJ, Ahearn ME. Spinal muscular atrophy, X-linked infantile. In: Adam MP, Ardinger HH, Pagon RA, et al., eds. Seattle (WA); 1993. 8. Prasad AN, Prasad C. The floppy infant: contribution of genetic and metabolic disorders. Brain Dev. 2003;25(7):457-476. 9. Khera S, Ghuliani R. Type 0 spinal muscular atrophy with multisystem involvement. Indian Pediatr. 2014;51(11):923-924.